Разстояние до летището 14,3 км. Имате въпрос към Na Place? Удобно проектиран като за бизнесмени така и за почиващи туристи, Na Place е идеално разположен в Банг Сарай - една от най-посещаваните части на града. Оттук гостите имат лесен достъп до всичко, което този оживен град може да предложи. С удобното си местоположение хотелът предлага лесен достъп до всички градски забележителности, които задължително трябва да се видят. В Na Place отличното обслужване и достъпните съоръжения допринасят за Вашия незабравим престой. Най-важните съоръженията на хотела са безплатен WiFi достъп във всички стаи, Wi-Fi връзка в общите части, рум-сървиз, семейна стая, ресторант. Атмосферата на Na Place се усеща във всяка стая. Удобства като безжичен интернет достъп (безплатен), стаи за непушачи, климатик, бюро, балкон/тераса са само някои от даденостите на обекта. Освен това в хотела можете да се възползвате от множество предложения за приятно прекарване на свободното време. Na Place е идеално място за туристи, търсещи чар, комфорт и удобство в Патая. Clean and easy staying in Bang Sarah but limited time in-out. A bit far from the beach. Odada mutfak vardı. Mikrodalga be fırın var. O yüzden giderseniz dışardan bişeyler alıp pişerebilirsiniz. I had a pleasant stay here. Alan and Na were nice and sincere, and they take care of their customers well. The room is big, really clean and has all you want (kettle, fridge, microwave, TV, etc). The English food is great, I had the fish and chips, sausage and mash, and breakfast - all real good. If you want a quiet place and some friendly banter at night, I’d recommend this place. The room is more like an apartment. the room is spotless with all the amenities you could wish for., the food is excellent, large portions and home made. Alan & Na are the perfect hosts, certainly nothing is to much trouble for them. I will definitely stay there again. I have no qualms about highly recommending Na's place to anyone. Отседнахме 6 вечер/и в юли 2017 г. Great place to stay, in the heart of Bang Saray town. Alan and Na could not do any more to help me. Even gave me a small tour of the area. This place could be called 'the Clean Place '. Big room with home cooking if you want it. Will visit again if in this area ! Отседнахме 21 вечер/и в октомври 2016 г. The room is more like an apartment, the food in the restaurant is really good and the people are very nice. We will definitely stay there again. it's a bit far from the city center. but the lifestyle there is really relaxing and comfortable. the host and his wife are very friendly that makes you feel at home. he even showed us around. when we left they took us to the bus station and told us how to find a nice hotel in bangkok. and the room is big and clean, with air condition, tv, fridge，private bathroom, even a small kitchen where you can do some simple cooking. im not fond of the pattaya beach area. there are too many people, crowded and noisy. but this place makes wanna stay and live there. it's in bang saray village. it costs you only 20 THB to get a minibus going to the downtown. so if you would really like to join the life in pattya, i highly recommend this hotel. We (three persons) stayed in two rooms (no. 2 and no. 3) for two nights. The rooms are above a restaurant also owned by Na. Room no. 2 is directly above the restaurant and Room no. 3 is above Room no. 2. The building is a townhouse. -Wifi Internet connection and speed is excellent. -No noise from restaurant below room no. 2. -Good aircon system, quiet, clean, dust free. -Large spacious room. -Water heater works!!! (E.g. The Wilkris does not guarantee you hot water -If you have a car you can park it on the street nearby. It is a quiet dead end road. Room no. 2 has an ensuite bathroom. Room no. 3 has a separate bathroom, so you have to exit your room to go to the bathroom next door. On our visit, this bathroom is exclusive to room no. 3 and is not shared. This was not a big issue but may be for some people. The price is excellent value and here are some pointers for what people should expect at this price point in Bang Saray, (if you want better go pay more for somewhere else): -No complimentary water: just go buy from 7 Eleven what you need. 7 Eleven in Thailand is open 24 hours for those who do not know. -You may want to bring your own shampoo and soap as what is on offer is minimal (or you can buy what you like from 7 Eleven if necessary). But you get towels provided by Na's Place and they were changed for the second night, which is excellent. -No breakfast (this is normal at this price!) BUT walk approx. 50 metres to the main road and you will find excellent coffee shops selling western breakfasts and Thai food as well. You cannot possibly go hungry at breakfast time and you are spoilt for choice when it comes to a western breakfast. -There is no "official" check in reception, just the restaurant but we didn't experience any problems with the casual set up. -Take note that there is a 1,000 Baht deposit per set of keys. There is a back door to allow guests 24 hour access when the restaurant is closed. My stay at Na´s place was very pleasant, the owners are very friendly and helpful and the room was clan and large. The location is ok for people who deliberately do not want to stay in Pattaya. Getting to Pattaya from Bang Saray where the hotel is costs either approx 15 US$ one way or cheaper but with a hassle. i could ' t imagine a better place . The room is huge and comfortable and you have everything that you need. Na & Alan are very friendly and helpful. Food in the restaurant is delicious and large portions. We slept well , here is absolute silence at night. It's a bit far from the beach and the Bang Sarey beach not always clean but there is no crowd, a lot of trees and you can see sunset and relax. Thanks a lot Na & Alan ! We will definetly come back one day. We had a really fantastic stay, Alan and Na were the most friendly and helpful hosts you could wish to meet! The very large apartment style room was very comfortable, clean and had everything you needed. The lovely little bar and restaurant area in the evening was great for chatting with people over a few beers and of course Na's fantastic English and Thai food, I only wish we could have stayed longer to sample a lot more from the menu but its most definitely worthy of a return visit! 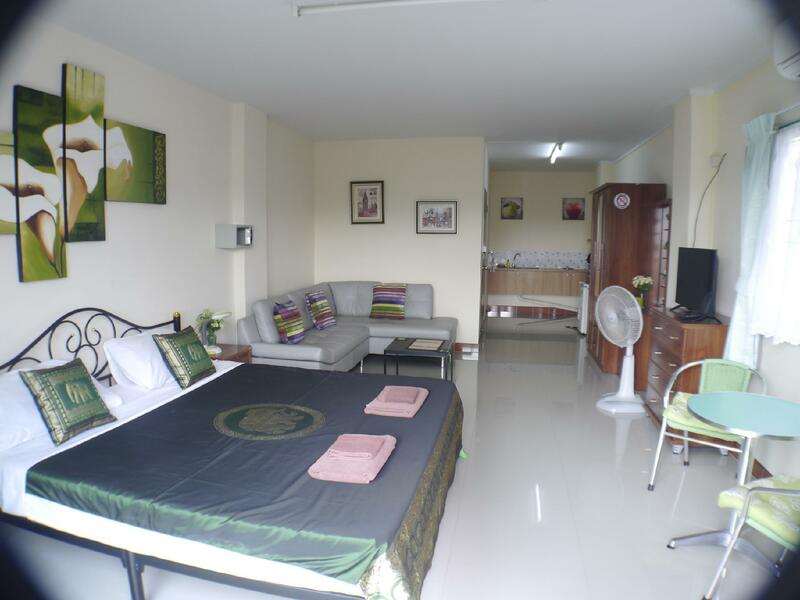 This small family run hotel is not technically in Pattaya.It is located in near by Bang Saray, which is just outside of Pattaya municipal limits and about 15 minutes from the city proper. It is a small village near the Thai Naval base and is the home to many fisherman.It is relaxed and quiet. It has its own beach, a few kilometer long and mostly empty. no jet skies, no para-sails and no venders selling you "genuine" Rolex for $10. the time you will see the most people is at lunch time as people come to have lunch on the sand. Food vendors set up on the side of the roadway. The village also has the best seafood restaurants in the area.While there are a large number of expats living in the area it is still Thailand. Na Place is owned by a British-Thai family and they made you feel very welcome.They have a small restaurant on the ground level which a number of the local expats seem to enjoy. the food is excellent. The room is huge, with a queen size bed. a sofa bed, a small table for eating, a full size refrigerator not a mini bar size one, in room safe,and plenty of space to hang your clothes. Centralt beläget med promenadavstånd till beachen. Har också en bra restaurant Med Thai och europeiska rätter. Understundom kan det hända att ägaren tar fram gitarren och spelar några finstämda låtar ur den nostalgiska repertoaren. Rummen är ovanligt stora med ett för den som behöver ett välutrustat kök. I övrigt är det en lugn miljö utan störande musik mm. Bangsaray ar ett mycket lungt omrade aven om det finns barer och restauranger. Kan inte jamnforas med pattaya. Med det ar man nog medveten om nar man valjer att bo har. Rummet perfekt o hade micro o massa annat. Verkligen valutrustat o stort. Akt MC dit ifran Naklua for att fa en utflykt. Perfekt. Lungt o skont. Hyggelige verter og god mat.